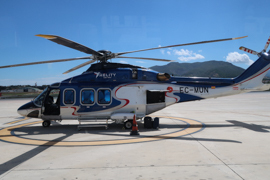 On the third day of my Six-Intercontinental-Flights Weekend trip in May 2018, I had the opportunity to fly the Spanish helicopter airline Helity twice, from Algeciras to Ceuta and from there to Malaga Costa del Sol Airport. This is a more detailed travel sum-up and review of my quite unique flight experience. 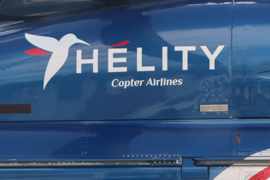 Helity is operating their network with Agusta-Westland AW-139 helicopters. I could not find exact information, but I guess they have two helicopters, EC-MLK and EC-MUN. 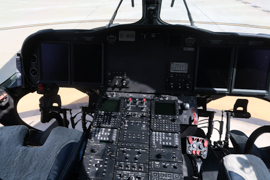 The helicopters are operated by two pilots and equipped with wheels, which is very important esp. 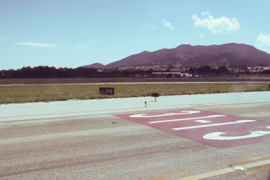 in Malaga, so that they are able to taxi on the ground. The AW-139 is some sixteen meters long and five meters high. The rotor measures 14 meters in diameter. 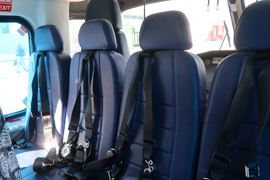 The helicopter has 15 passenger seats, three rows of five seats each. The first two rows face each other, the third one is individual. 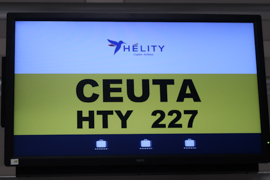 Helity is based in Ceuta and covers two destinations from there. 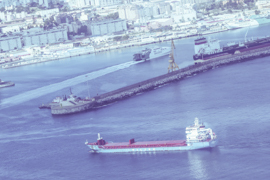 The key route is connecting Ceuta with Algeciras (or vice versa). There may be up to six flights each way. Helity gives the official flight time of seven minutes for this trip – when I did it, it took nine minutes. 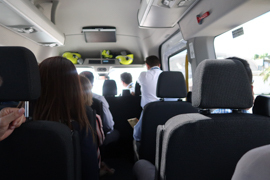 The prices vary between 35 and 60 EUR per route – the cheapest price is majorly the Friday afternoon service from Algeciras to Ceuta, as the vice versa route is very popular with the Ceuta residents. 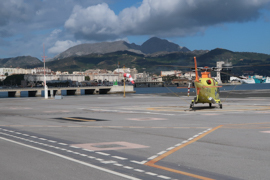 The Algeciras heliport is located within the ferry port area, the Ceuta one in walking distance to city centre. 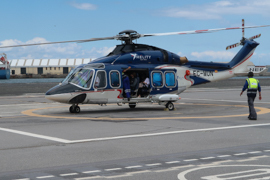 The second route is a direct connection of Ceuta heliport to Malaga International Airport, where you may also connect to (airplane) flights directly. 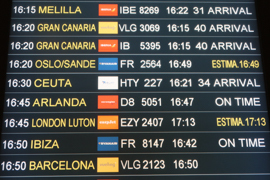 There is a maximum of three daily flights which again price-range between 120 and 150 EUR. 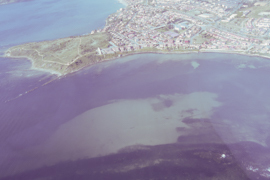 For all prices mentioned in here, Ceuta residents receive a 50 per cent rebate. There is also a discount for families. 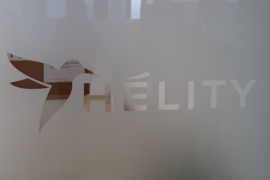 The company’s website, helity.es/ is designed for the Spanish market, but allows translation to French and English, which works quite fine. I did not manage to switch the booking process to English. However, the process went quite smoothly. The major hurdle I had to take was that the booking process requires a second surname, like this is characteristic in Spain. I just entered “(I don’t have a 2nd surname)” and this went absolutely fine. Alternatively, you may of course call the Helity office for booking. All Helity team members I met at least spoke reasonable English, so that there was no problem in communication. Legally, Helity booking are fully equivalent to airplane flight tickets. 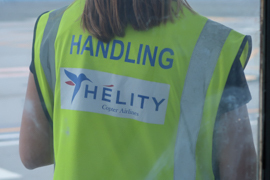 This majorly also means that Helity has to comply to the European Passenger Rights, which define your rights in case of delays or late-notice flight cancellations. 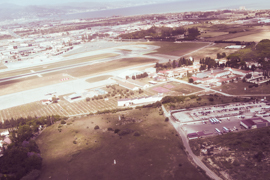 Both heliports, Ceuta and Algeciras, are operated by the Spanish airport authority AENA – of course, this is also the case for the Malaga international airport. Helity tells you to be at the heliports at 30 minutes before schedule. This feels to be quite reasonable timing. The flights are handled like airplane flights with checked-in hold luggage. You have a 20kgs luggage allowance, the suitcase size is limited to 69x45x30cm due to the limitated hold space. However, I cannot say how strict Helity is about the suitcase size. Hand luggage is standard sized with a maximum of 10 kgs. However, when the flight is fully booked, hand luggage may also be transported in the hold on top of the checked luggage – which is quite convenient, as you are not allowed to put you hand luggage under your seat / under the seat in front of you. 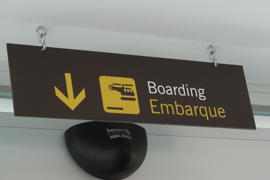 The security and boarding process is very similar to any other flight. 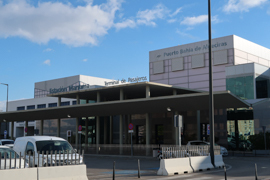 Hand Luggage is scanned for liquids (which caused a loss of two passengers’ perfumes on my Ceuta – Malaga leg *smile*), notebooks need to be removed from the hand luggage. The safety screening is done by video in the terminal. I am not fully sure how Helity does the process at Malaga airport. 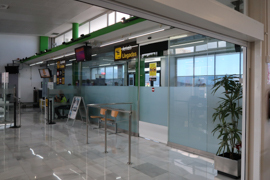 The use ordinary check-in and security facilities, so that I guess you are able to use all shopping and restaurant facilities at Malaga airport. 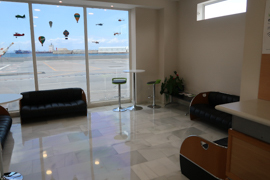 There are no proper lounges or similar amenities. 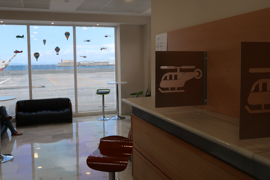 However, the Ceuta heliport has a quite nice waiting room with workspaces, which gives quite a lounge feeling to the passengers. Of course, there is no catering onboard. 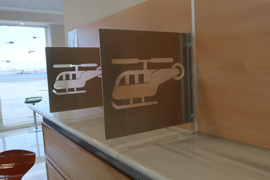 There is also no catering (neither complimentary nor for sale) at the heliports. 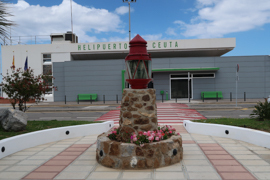 There are shops nearby Ceuta heliport and similiar facilities in the ferry terminal in Algeciras. 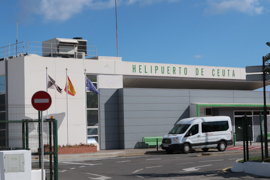 I had two legs with Helity on 26th May 2018: the first one was the short hop from Algeciras to Ceuta. 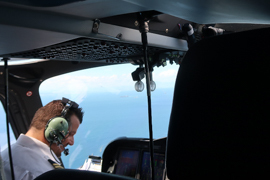 The helicopter was booked with twelve people, so that the flight was very convenient. Most people seem to enjoy this trip and somehow did it for fun – many took a lot of pictures from the flight (as I already mentioned in the Day 3 thread of my Six Intercontinental Flight Weekend Trip Report, the windows are tinted in dark blue so that it is hard to reduce their effects in Photoshop completely). This route is just amazing. 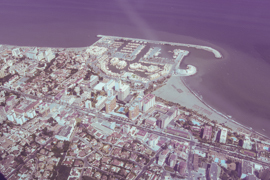 You have views of Gibraltar, of the Strait of Gibraltar and the massive sea traffic in that area. 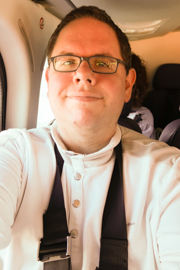 As the flight was not fully booked, I also felt very comfortable. 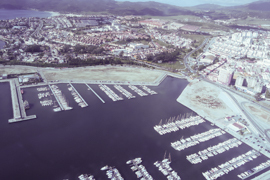 The second leg I took was the afternoon route from Ceuta und Malaga. After take off, the key sights of this route are definitely the beaches of Costa del Sol. The AW-139 approached the airport from South, i.e. neither from Southeast nor from Northwest which would be the normal approach routes for airplanes. 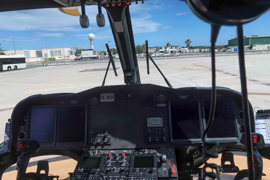 As far as I could see, it landed on the ordinary runway and then taxied to a designated parking position at the Southeastern part of the apron. This flight was less comfortable as it was fully booked. I took a reverse seat at the window, but with four other men sitting in the same row, it was really narrow. At the airport, a Helity car is collecting the passengers and their luggage. Hand luggage is delivered in front of the terminal entrance, hold luggage at a luggage belt. Due to the special custom situation, the luggage belt is in the non-EU area. 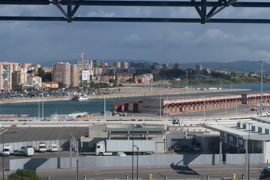 However, the Spanish customs did not seem to be too interested in Ceuta luggage. Furthermore, there was no custom check if you travelled with hand luggage only. 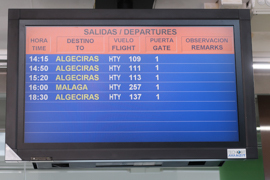 Between Algecrias and Ceuta, there are multiple ferry option as an alternative transfer: for a random day in June, I found some fifteen daily ferry connections on that route only. Thereby, you may choose between “ordinary ferries” and “superfast” ones – both are able to carry cars as well. The quicker one takes about one hour, while the ordinary ferry is about 90 miniutes. The price is roughly 30 Euro for a single-travelling adult. 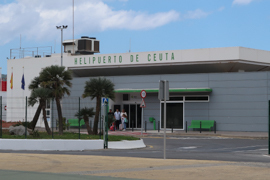 Travelling from Malaga to Ceuta is more complicated. On the same day, I just found two connections. 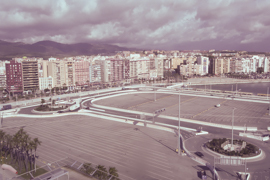 The price for a passenger without car is not that much more than on the route from Algeciras, but the travel time is between six and nine hours (so that even driving from Malaga to Algeciras and taking the ferry from there may be easier, if you happen to have a car and do not take the travel expenses including road toll into account). You may of course fly by plane and do overland transport. 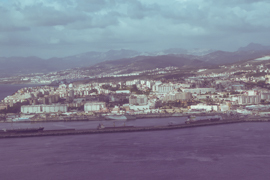 The most straightforward trip may be via Tangier, which I explored on Day 1 and Day 2 of my Six Intercontinental Flight Weekend trip. From Tangier, there are busses and Grand Taxis to the Ceuta border, but overall, I would not count this as an alternative. If the Agusta-Westland is fully booked, I would not really use the word “comfortable” for travelling with Helity (or least make sure that you are travelling with some super-slim supermodels instead of average to oversized business men). But there are other attributes I would absolutely assign to it: impressive, amazing, unforgettable. Especially the views of the Strait of Gibraltar on the short hop between Algeciras and Ceuta and the ones of Costa del Sol before landing in Malaga were just incredible. I feel that the value for money is very reasonable as well. 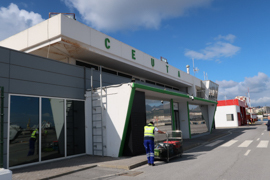 Thus, if you are around and think about travelling to Ceuta, I would absolutely recommend to do at least one of the legs of your trip by this air service instead of boat (and car, if you go to Malaga). This article has been selected as the 3rd most important article in 1st half 2018 in my Very Important Postings post. 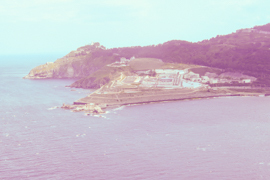 Africa, Airlines, Southern & Southestern Europe, Spain, Special Flights, Top Pick!